A Brazilian-American team including Vinicius Placco, a research assistant professor at the University of Notre Dame and a member of JINA-CEE (Joint Institute for Nuclear Astrophysics — Center for the Evolution of the Elements), and led by Jorge Meléndez from the University of São Paulo used two of European Southern Observatory’s telescopes in Chile to discover this star, named 2MASS J18082002–5104378. Although thought to be ubiquitous in the early universe, metal-poor stars are now a rare sight within both the Milky Way and other nearby galaxies. Metals are formed during nuclear fusion within stars, and are spread throughout the interstellar medium when some of these stars grow old and explode. Subsequent generations of stars therefore form from increasingly metal-rich material. Metal-poor stars, however, formed from the unpolluted environment that existed shortly after the Big Bang. Exploring stars such as 2MASS J18082002–5104378 may unlock secrets about their formation, and show what the universe was like at its very beginning. 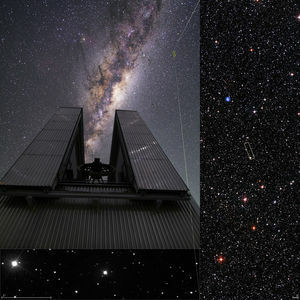 The results have been published in Astronomy & Astrophysics. In addition to Placco and Meléndez, the team consisted of Marcelo Tucci-Maia, Universidade de São Paulo, IAG, Brazil; Iván Ramírez, University of Texas at Austin, McDonald Observatory and Department of Astronomy; Ting S. Li, Texas A&M University, Department of Physics and Astronomy; and Gabriel Perez, Universidade de São Paulo, IAG, Brazil. Originally published by William G. Gilroy at news.nd.edu on January 22, 2016.